Summer is here and we’ve got everything you need to create birthday cakes, Wedding Cakes and Celebration cakes, from our most popular cake decorating products to brand new and exciting cake decorating equipment, all available from our Sugarbliss Cake Decorating Shop, Knowle, Solihull, West Midlands. Between weddings cakes, birthday cakes and garden party cakes, there’s always plenty of summer events to plan for, so make sure you get summer- ready with our best selling cake decorating supplies. Unicorn cakes remain a top trend in the cake decorating world, having taken social media by storm over the last year. These fantastic colourful birthday cakes uses plenty of colour and sparkle, making them very popular choice for children’s birthday parties and special celebrations. Check out our simple unicorn how-to guide. 1 Secure the cake to your cake board using a small amount of buttercream. 2 Colour a large bowl of buttercream with the Pale Pink gel. 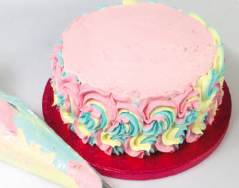 Using a palette knife, spread the pink buttercream over the top of your cake. 3 Divide more buttercream into 3 bowls. Colour one bowl using more of the Pale Pink gel, one using Blue and one using Lemon. 4 Fill three piping bags with each of your three buttercream colours. Cut 10mm off the tips of each bag. 5 Insert the 2D drop ower nozzle into another piping bag and carefully insert the three lled piping bags, ensuring the ends are level and as near to the nozzle as possible. 6 Pipe an individual swirl of buttercream on the base of your cake. Continue all the way around until all the cake is completely covered. 7 Mix the Purple Cupcakes pearls and vermicelli together in a bowl. Sprinkle on the top of your cake in an arc shape to create a colourful rainbow. 8 Add your mini ower sugar pipings. 9 Roll out your gold metallic modelling paste and cut out your desired name and age using the Push Easy cutters. Secure to the top of the cake towards the front edge. 10 Place your unicorn on top for the perfect magical finish! Simple Wedding Cakes Ideas For 2017. There is such a large choice for your wedding cake designs, it may seem a little bit overwhelming when trying to decide on the perfect wedding cake for your special day. From metalic wedding cakes, naked wedding cakes, to bespoke wedding cakes and cascading rose flower wedding cakes, just to name a few the list of wedding cake designs is seems truely endless! Your wedding cake will be a focal point of your reception, so it’s important to think about what wedding cake design is right for you. 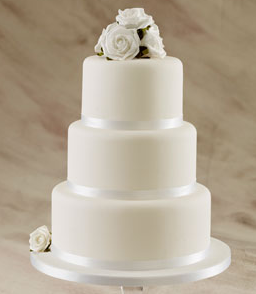 If your wedding is an informal or intimate occasion a more simple wedding cake could be the perfect choice for you. 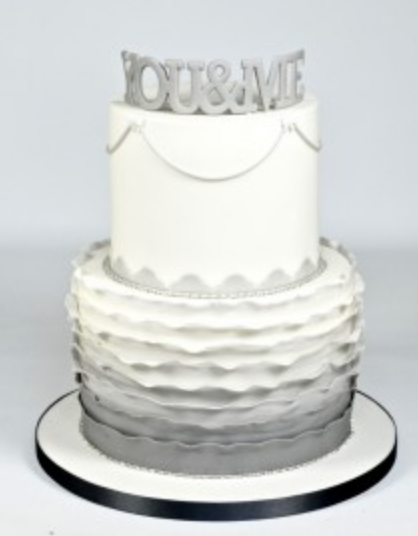 At Sugarbliss Cake Company, Solihull, West Midlands we have a simple but elegant range of 15 beautiful but simple wedding cakes which have been created using cake designs from our most popular wedding cake creations. Our simple wedding cake collection can be personlised by adding cake decorating toppers, sugarflowers, bride and groom cake toppers or fresh flowers for example. One of the easiest ways to give any wedding cake an extra special touch is to use a cake topper that reflects the wedding theme and personalities of the couple. Today there’s an array of styles to choose from whether you are looking for cute figurines, rustic wording or sparkling hearts. We have a fantastic selection of wedding cake toppers available from our cake decorating supplies shop, solihull, west midlands for you to choose from. Colour drip cakes are one of the hottest and most colourful and inspiring fun trends for 2017. Although drip birthday cakes and wedding cakes have been popular for several years, the colourful and inspirational designs are perfect for any birthday cake or celebration cake design. These fabulous cakes are perfect making a big statement that is all about the fun factor at birthdays and even weddings. 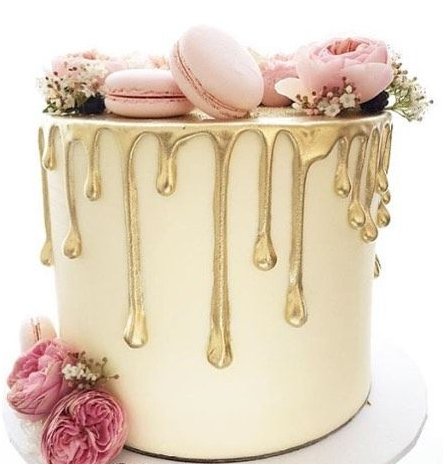 Usually, colour drip cakes are sponge cakes that have been covered in fondant or left naked and finished with a layer of dripping coloured ganache, chocolate or caramel trickling down the sides. Not only are they great for bringing vibriant colours together but they’re also ideal for combining different cake flavours. 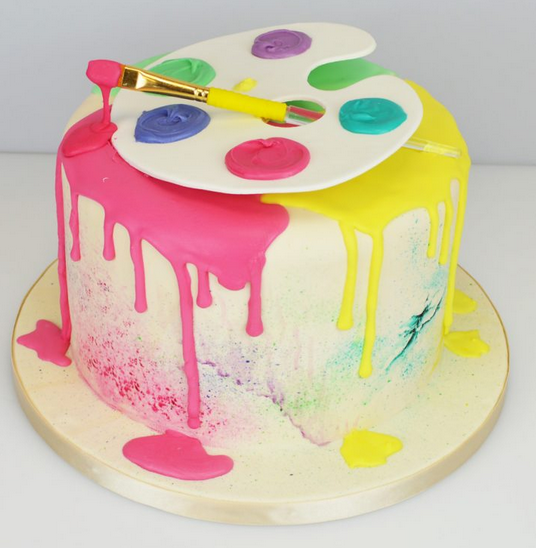 We’ve put together some awesome colour drip cakes to inspire you – why not try to recreate your favourite one or come up with your own fun designs! At Sugarbliss cake decorating supplies shop, Solihull, West Midlands, we have all the colours,ingredients,cake boards and cake decorating equipment, plus great customer service for you to create your very own drip cake birthday cake or wedding cake. For a cake that oozes sophistication elegance and glamour then look no further than these stunning designed birthday cakes. These vibrant coloured chocolate drip cake! are fantastic cakes for any birthday cake celebration. Covered in colourful sprinkles and topped off with chocolate ganache to create an absolutley stunning birthday cake. Let Sugarbliss Cake company create your elegant birthday drip cake or wedding cake, from bright rainbow colours to elegant gold cakes we are sure we can create the perfect designed cake for you celebration. Simply give us a call or pop in to our cake shop. We had a fantastic day delivering and setting up our beautifully designed Gold Rose Flower Wedding Cake at the stunning Chateau Impney Hotel, Droitwich, Worcestershire. 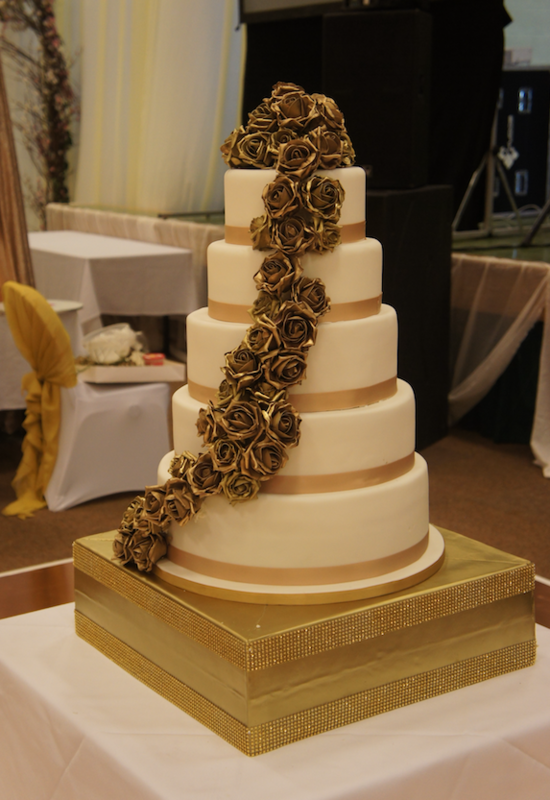 Our gold rose wedding cake was created from our delicious chocolate Oreo, Vanilla & Raspberry and Lemon flavoured cakes. Adorned in beautiful gold roses cascading down the front of this 5 tier elegant wedding cake this wedding cake took centre stage in one of the many suites at the resplendent Chateau Impney Hotel. We have over 30 exciting new cake decorating products this month all available now from our cake decorating shop, Solihull, West Midlands. Some of our new cake decorating supplies include the very popular Cake Star Push Easy Shape and Flower cutters, new palette knives and texture mats which are a simple way for adding texture patterns to your sugarpaste icing and perfect for birthday cakes, as well as, themed wedding cakes. We’ve also got the popular FMM Bunting and Owl Cutters in stock. Making your own edible bunting to decorate birthday cakes, cupcakes and wedding cakes has never been easier with the new Bunting Cutter set by FMM. Each set includes three different cutter sizes to suit all cake types. This cake decorating product has been very popular with our proffessional and home cake decoraters. 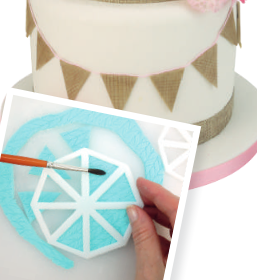 Create realistic effects with our fantastic range of new texture mats for cake decorating. Easy to use and very effective, these mats are perfect forcreating textures that can add depth to birthday cakes, cupcakes, biscuits and bespoked elegant wedding cakes. Our exciting new range of cutters are now available in our Cake Decorating Supplies Shop, Solihull, West Midlands. Oue new range of sugarcraft cutters are perfect for creating cake decorations for wedding cakes and birthday cakes. Our new curved words Mr&Mrs and You&Me are easy and simple to use to create stuuning wedding cake toppers. Our new easy ever carnation flower cutter lets you create perfect sugarflowers to simply add to a single tiered wedding cake or why not create a cascade effect on your wedding cake design. We also have some real fun but brillant easy to use cake decorating cutters, making a birthday themed animal or jungle cake look amazingly proffessional. 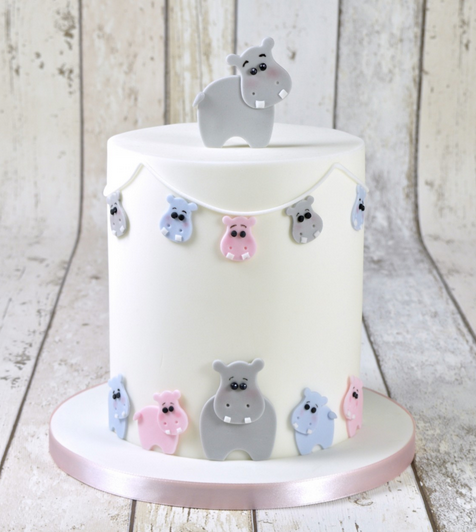 Our Giraffe and Hippo cutters can also be used to create stunning baby shower cakes or cute 1st birthday cakes. If you Love Sugarflair products Why not try Sugarflair’s selection of beautiful spring paste colours to help inspire your customers as we step into the elegant wedding cakes season! The new range of colours include lavender, flamingo and daffodil and are perfect for creating spring and summer sugar flowers to adnorn any summer wedding cake. We have a fantastic range of high quality cake boards in all different sizes, shapes and colours available from our cake decorating shop, solihull, West Midlands. Our cake boards are perfect for creating wedding cakes, birthday cakes and tiered wedding cakes. 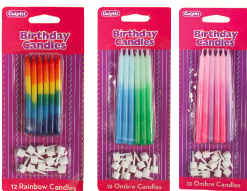 Check out some of our great cake decorating supplies offers we have throughout this summer. Get a 10% discount on cake boards, cake cards and cake boxes this summer when you buy 2 or more. You can also mix and match to ensure you are getting the right cake boards, cake boxes and cake cards at great value pricing. All available from our Sugarbliss Cake Decorating Shop. 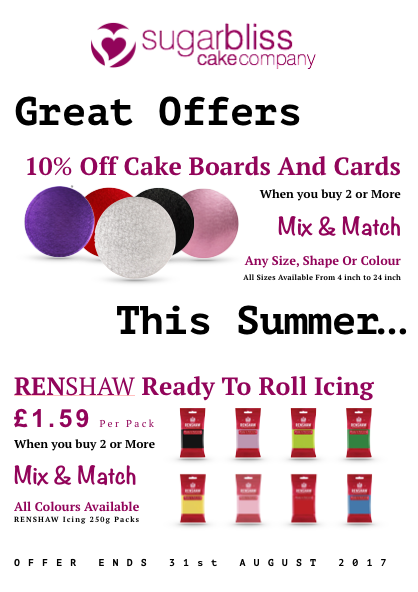 We also have a great offer on all of our Renshaw Ready To Roll Sugarpaste Icing packs of 250g. Buy 2 of our 250g sugarpaste from Renshaw for £1.59 per pack on our full range of icing colours.